A DIY headboard will not only beautify your bedroom, it will also add a personal touch without breaking the bank. If you’re struggling to make your room look better on a budget or if you want a simple project for the weekend, you’ll find plenty of ideas among our suggestions. Get inspired by these recommendations that involve fabrics, old wood, refurbished doors and carpets. What will you get out of it? A DIY headboard will give you time to relax and blow off some steam while you’re improving the appearance of your bedroom. 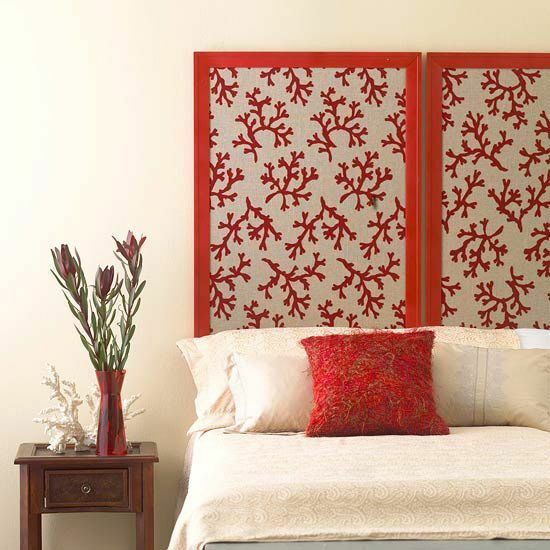 This quick and easy DIY headboard can create a striking effect and can be customized in any way. To carry out this project, you’ll need six frames and photos, drawings or posters of your choice. Make sure the style complements the rest of the room. You can’t go wrong with black frames and wide, white Passe-Partouts. Allow your imagination to go wild and experiment with colors and sizes. Choose abstract paintings for a somber look or vivid portraits for a playful touch. 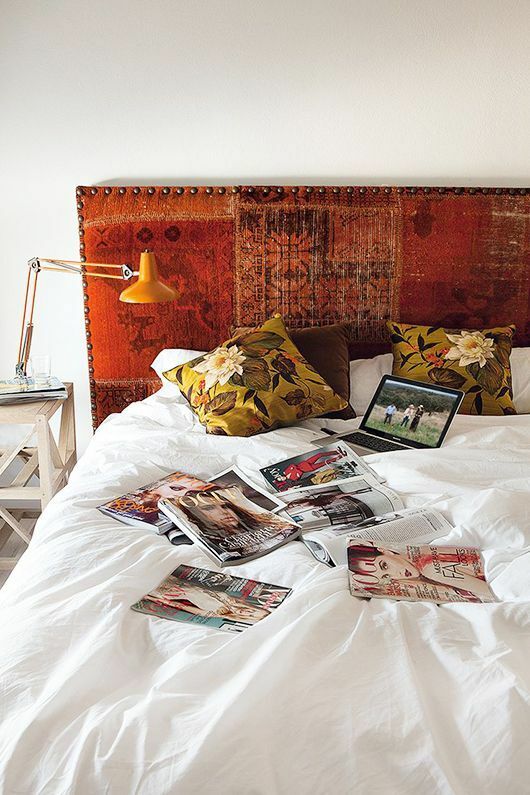 Carpets are not only meant to adorn our floors, they can also be mounted on the wall and, they make a great DIY headboard. For a beautiful effect, choose a carpet in two colors that has a nice, velvety texture. This will add an elegant touch to any room. 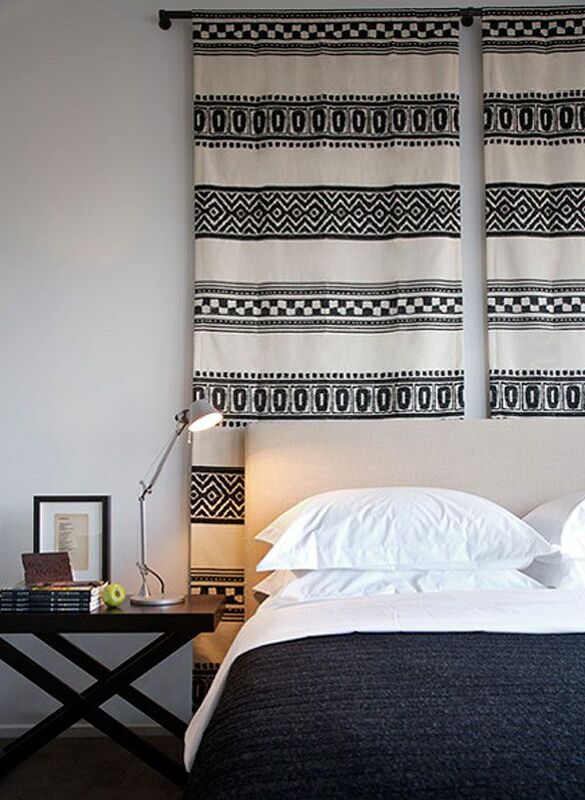 Once you have the fabric of your liking, hold it up against the wall, right above your bed to see if it needs any trimming or adjusting. Once you’re happy with its placement, you can go ahead and nail it to the wall. If you like to feel like you’re still on vacation in Hawaii, you should try out this inexpensive DIY headboard. It instantly adds a pop of color to any room and makes going to sleep something to look forward to. For this project, you’ll need a few flower garlands in one to three colors. Avoid picking too many colors so as not to overwhelm the relaxing atmosphere of the bedroom. You can stick the garlands onto the wall, onto a plain headboard or tie them to a thick branch mounted on the wall. There’s nothing more pleasant than reading a few pages before going to bed. To keep all your favorite books at hand, try out this practical suggestion. Use an old wooden shelf unit that might have been a family inheritance and doesn’t look so good on its own. Apply a fresh coat of paint, if needed, and set it behind your bed, as a headboard. It will serve as a great nightstand and will make your bed look more beautiful. There is beauty in almost everything – even in unpolished doors. 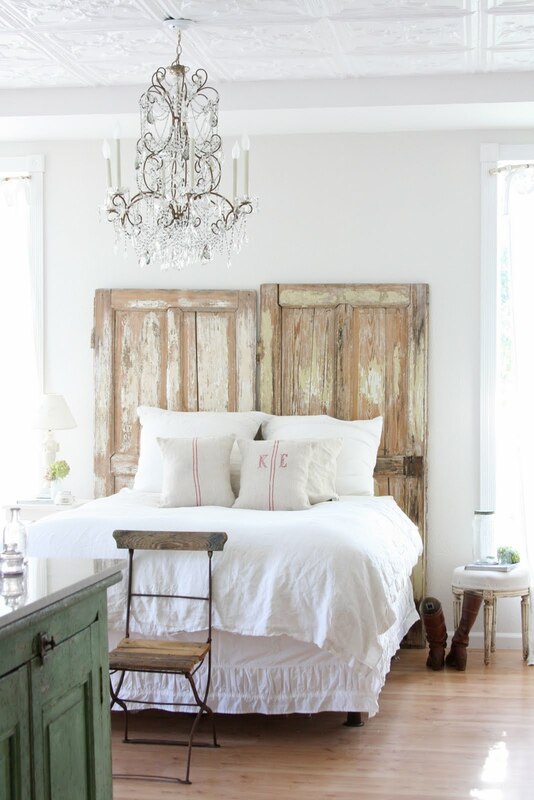 If you have a soft spot for vintage or rustic design, you’ll fall in love with this trick on the spot. 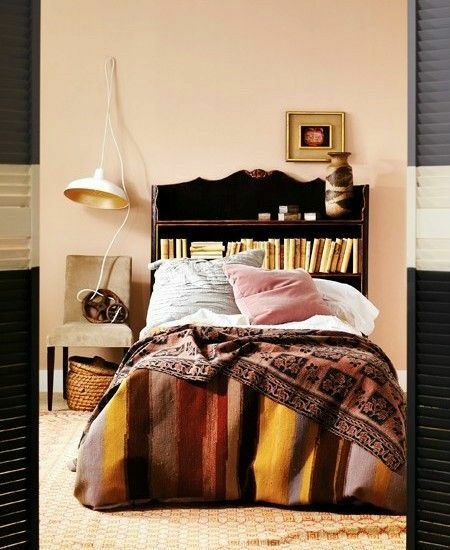 The doors offer a lot of personality to the room and make for an affordable DIY headboard. You can use doors that you might’ve considered throwing out and distress them even more. They will serve as a beautiful panel that will look striking against white walls and white linen. To make sure the doors stay put, you can nail them to the wall in multiple places. For an elegant DIY headboard, all you’ll need are a couple of frames and the fabric of your choice. Choose two big frames that will fit the bill or several smaller ones to cover all the area. The combinations are countless and you can play around with the shape and size of the frames, as well as with the color and texture of the fabric. To make the fabric taut, you can glue it onto cardboard, which will also make it easier to frame. You don’t necessarily need a window to put up some curtains. They create a nice effect and it’s up to you what patterns and colors you choose. To carry out this headboard DIY, all you’ll need are a couple of curtain rods and two curtains. You can reuse old ones or invest in new curtains that will better match the bedroom’s style. As a pro-tip, install the curtain rods so that the curtains peek out at the bottom from behind the bed. Adding color to the bedroom can be done in a more elegant manner with an upholstered, nail button DIY headboard. The needed tools are plywood in the right shape and size, quilt batting, nail buttons, fabric, a mallet and a trim kit. Add the quilt batting on the plywood and follow up with the fabric. Use the trim kit to pin the nail buttons and secure the fabric in place. You can also use nailhead trim, and only secure every fifth nail. Don’t substitute the mallet for a regular hammer in order to avoid ruining the nailhead trim. Fans of Arabian Nights will surely enjoy this DIY headboard. 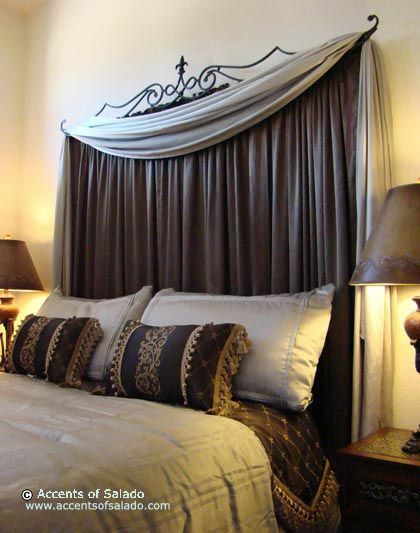 The drapes create a mysterious atmosphere that is best paired with golden tassels and swirls. To achieve this beautiful project, you will need a curtain rod and drapes of your choice. Opt for a material that will beautifully drape around the rod and make for an interesting texture. If you’re talented and you fancy the idea of sleeping under something you painted yourself, you can transform a screen into a headboard. Painted wood or cardboard will liven up any bedroom and add a personal touch. You can experiment with this DIY headboard in countless ways. Toy around with patterns and colors until you find what best suits the design of the bedroom.